We both woke very early this morning--about 4:30 am. We looked out the window---and no rain--yaaaay! 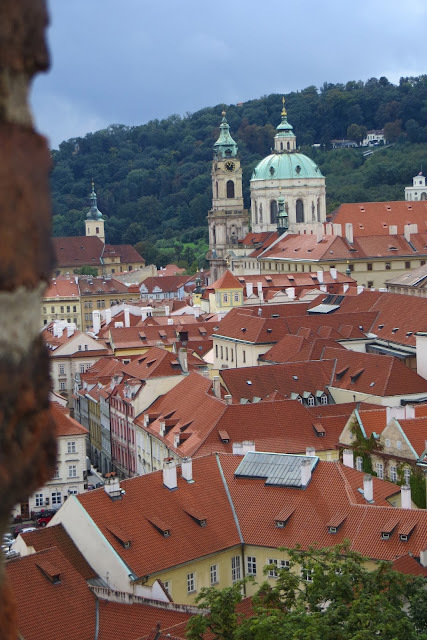 Our plan for today was to go to Prague Castle and then to near by Prahov Monastery, where we'd have lunch and visit the monastery and grounds. It's located on the outskirts of downtown Prague, set up on a hill. 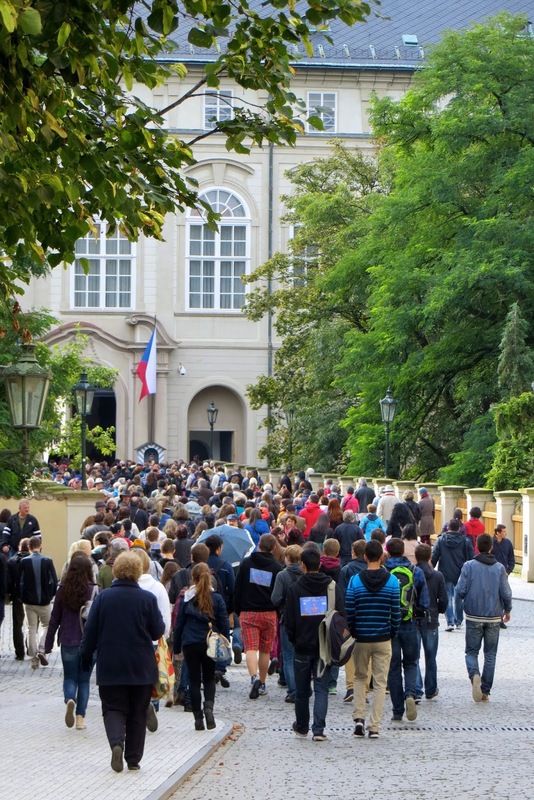 We found our way on the tram up to the entrance to the castle grounds, and joined the MANY other tourists making their way into the castle. 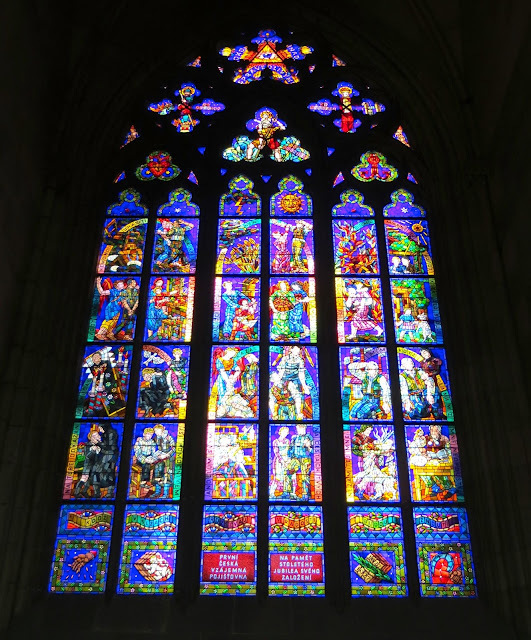 For us, the main attraction was St. Vitas Cathedral. The first church at this location was built in 925 A.D., the the current cathedral dates to 1344, it's completion took over 100 years. 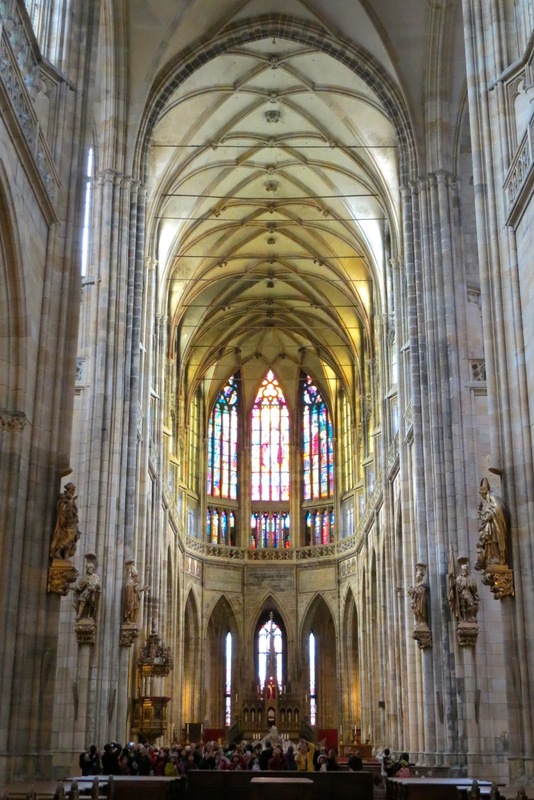 It is a beautiful example of Gothic design, and we both really enjoyed the interior. 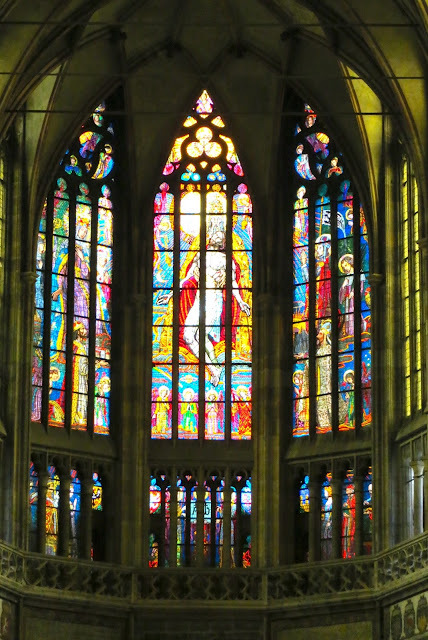 The stained glass windows in St Vitas are amazing--some of the prettiest I've seen. Just one of the many beautiful windows--all except one window were made up of tiny pieces of glass, in very intricate design. But the most beautiful window is one designed by Alphons Mucha, the great Art Nouveau artist. 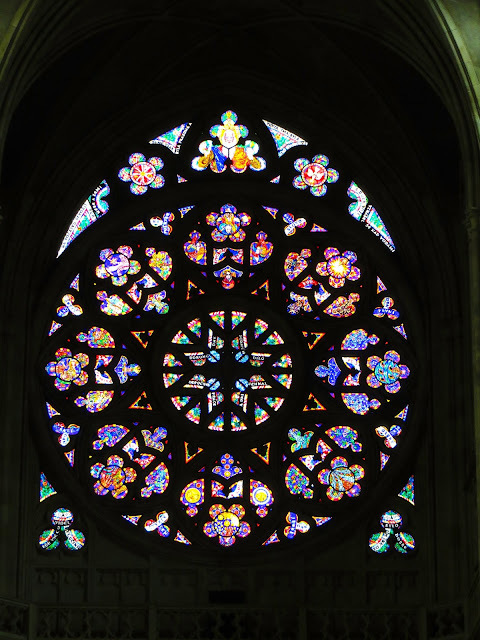 This window was commissioned during reconstruction work, and was installed in 1931. 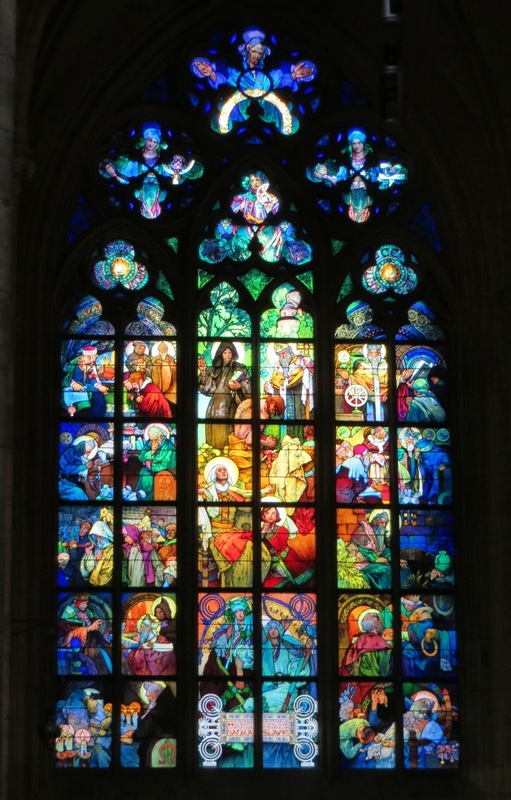 It features St. Wenceslas in the center, surrounded by scenes depicting the lives of St Cyril and St Methodius. The emblem at the center bottom is that of the bank that funded the window. Here are a few photos--but they really don't do it justice--it is stunning! If you're on an iPad--be sure to zoom in on the details--amazing! This next room is The Chapel of St. Wenceslas, where the relics of St Wenceslas are kept. It's pretty ornate--the lower part of the walls are decorated with over 1300 semi-precious stones. 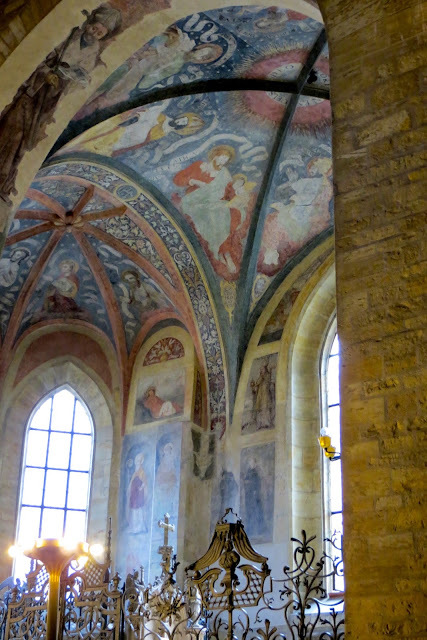 The paintings are from the original chapel, 1373. The public can't enter the room, only view it from the doorways. There is also a small door in one corner of the room, and it has 7 locks. This door leads to the Crown Chamber, where the Czech Crown Jewels are kept. They are displayed only one every 8 years or so. Each of the seven locks are different, and each key is given to trusted officials such as the prime minister, the bishop of St Vitus, etc. All 7 must be present to unlock the door! After our visit to St Vitas Cathedral we again joined the throngs of other tourists visiting the castle. The origins of this castle date to the 9th century, and in it's current state from the mid 1500's. 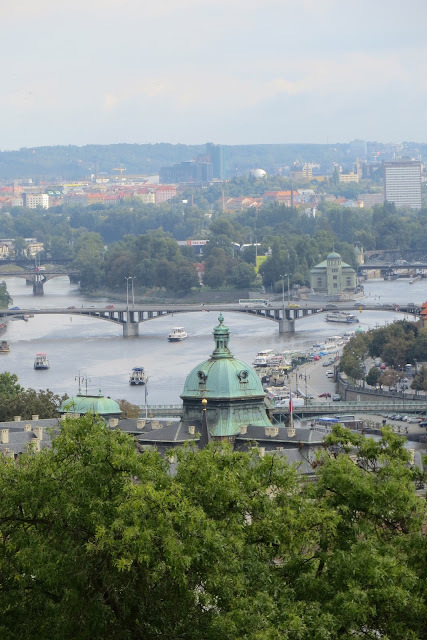 It's now considered the seat of The Head of State of the Czech Republic. It has had many restorations and reconstructions, but one can still see some of the original "bones", and the architecture is very interesting. Next to the castle entrance is St. George Basilica and Abbey, founded in 920 A.D. 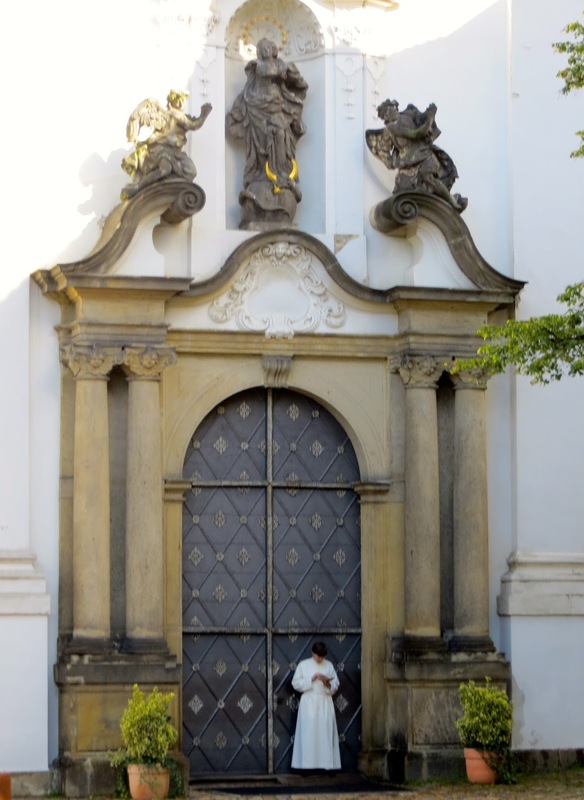 It was rebuilt in the mid 1100's, and the facade dates from the late 17th century. 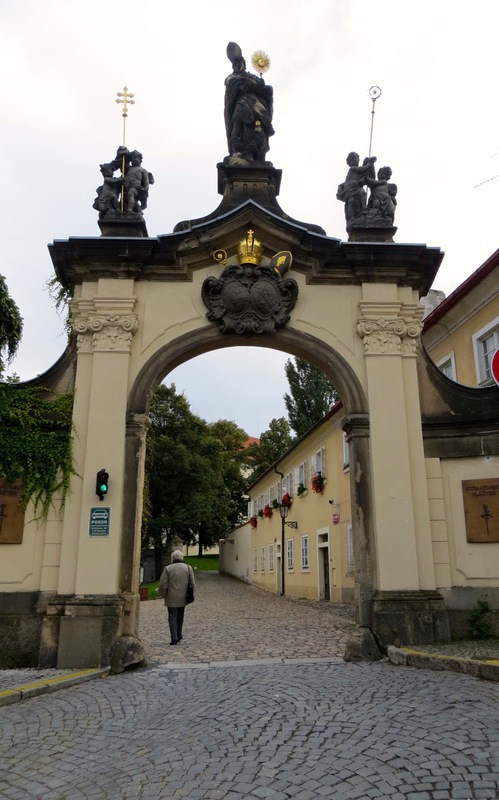 We came out of the Basilica and wandered around the grounds of the castle, walking down "Golden Lane". 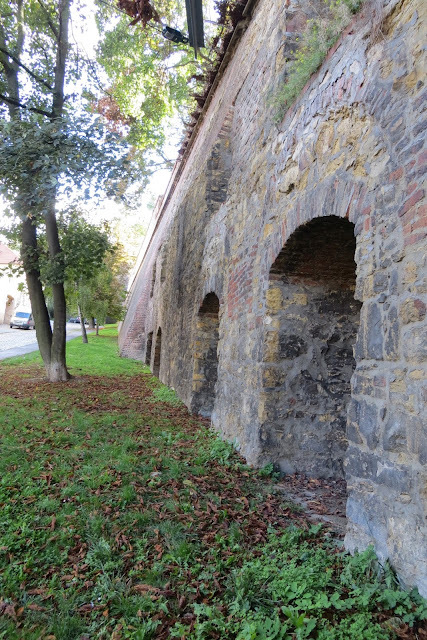 There are tiny dwellings attached to the north wall of the Castle, these were originally inhabited by castle servants. Each tiny "house" has been restored to look like it did in the 16th century--but looked a little "staged" to us. Later these homes were occupied by Prague residents, up until the time right after WWII. 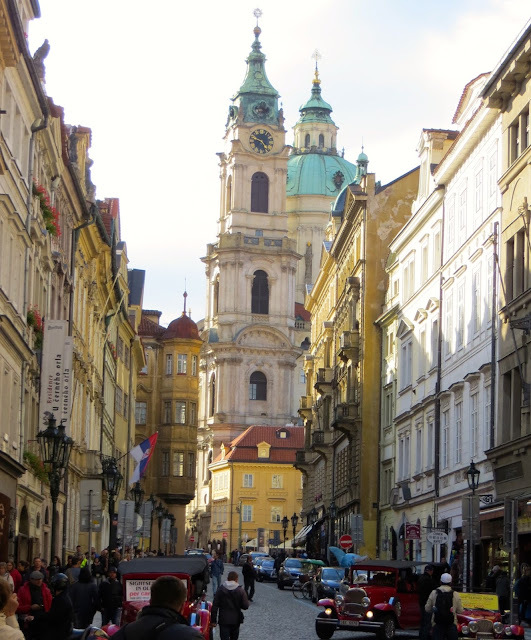 We had a long hike back down the hill, where we caught a tram to a stop near The Strahov Monastery. While we were on the tram we met a nice young couple, Steve and Leah. They are Americans living and working in Singapore, and were in Europe on a 3 week trip. We chatted with them on the way up to the monastery. We were definitely ready for some lunch and a beer, too. We had a choice of several restaurants on the monastery grounds, but of course we chose the small restaurant inside the brewery! They are quite the young beer connoisseurs, and even brew their own beer in Singapore. It was fun to compare tasting notes while enjoying the locally brewed beers. Dave and I each ordered an entree for lunch, Dave had beef goulash, and I ordered what I thought was a ham hock stewed in beer--but was actually a pig knuckle---oh, well. What's a few more ounces of pork? Each country we've visited so far is definitely pork country-- I think we'll both be "oinking" by the time this trip is over! Our opinion on lunch and beer: Just "OK". The food at Andech's in Munich was much better, as was the beer. But we really enjoyed the company! After our lunch and beer tasting, we said goodbye to Steve and Leah and walked around the grounds. We had hoped to visit the pretty church, but there was a service, so we couldn't go in. We left the monastery grounds and noticed this ancient wall right outside the entrance. We later read that it was built in the 1300's by order of Charles IV. The construction of the wall provided work for the many poor and starving residents during the famine of 1362. It is commonly called "The Hunger Wall", and legend tells that Charles IV himself worked on the wall for several hours each day, to help and serve his beloved people. We walked back down the hill (up the hill, down the hill--repeated many times today!) to the tram stop, and caught old reliable Tram #22 back into town. We decided to get off at a stop right across the river so we could walk over The Charles Bridge. 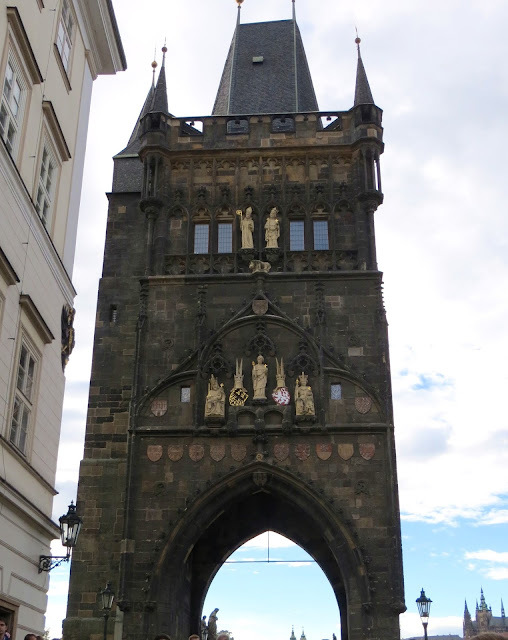 The Charles Bridge across the Vitava River was built by Charles IV, starting in 1357 and finished almost 50 years later. It's now Prague's #1 tourist attraction, and was so mobbed that I didn't even take pictures! But we did enjoying strolling across the bridge, and looking at the 30 statues that line both sides of the bridge. And we saw another bride and groom, this couple was walking back and forth and posing for their wedding photos--I'll bet she was c-o-l-d! 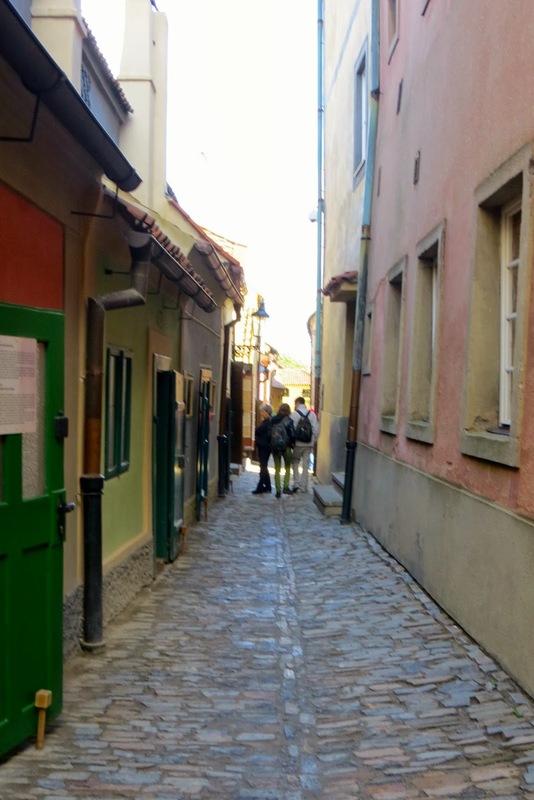 The bridge leads to an older section of Prague, so we wandered the streets for a while. We wanted to look inside the big church with the copper dome, but it was closed for a concert. We stopped into a small, cozy restaurant to have a "sit-down" and a couple of beers. I wanted to try a Budvar, which is Czech for Budweiser. Budweiser beer originated in what is now The Czech Replublic, and beer brewing in this regions dates back to the 1300's. 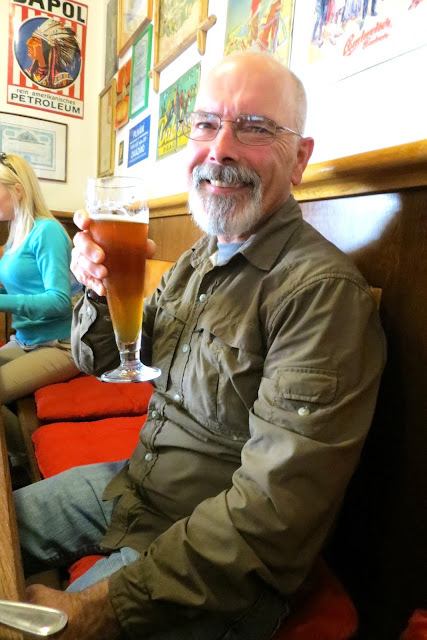 Here I am, enjoying (well---kind of enjoying) my Budvar. It wasn't that great--maybe one teeny, tiny notch above Budweiser in the US. I did laugh when I noticed the music that was playing as I ordered my Budvar--Michael Jackson singing "I'm Bad". Yes, I was BAD for ordering a Budvar! By now it was almost 6 pm, and we'd had a long day of walking and climbing up and down hills! We hopped on good old Tram #22 again, going back across the river to "our" side. 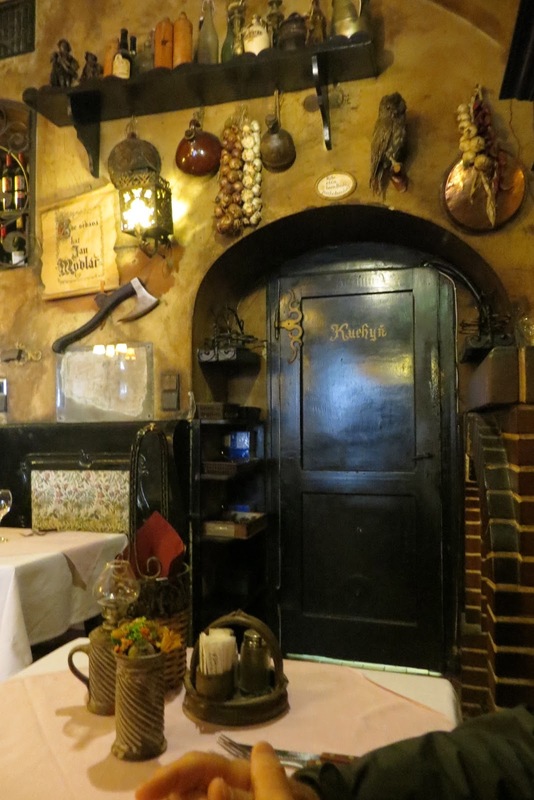 For dinner we returned to the same charming little restaurant from our first night in Prague. We knew it was a sure bet for a good dinner, and we weren't disappointed! We ordered two entrees to share, and shared a carafe of good red wine. Mustard Glazed pork ribs (pork again!) -the meat was tender, melt in your mouth delicious! We sat in a nice cozy booth next to a window, relaxing and enjoying our delicious meal. It was a nice ending to another wonderful day in beautiful Prague. The windows by Alphons Mucha must be painted, right? The level of detail is awesome! The pork ribs and stew look delicious. Monastery was awesome. Stained glass windows beautiful. Loved seeing the two bride and grooms. First bride had such a cute white coat over her gown. Steve and Leah....liked reading about them too. I wonder though...I don't like beer much...what would Brenda be drinking in Prague? Hello. Steve and Leia here. We are unpacking from our journey and came across your note with your blog address. It was great to read and be in your blog! :) It is great to see your perspective on the places we went as well. We look forward to reading more about your journeys. Great to meet you guys!